Roots+Fruits is a responsibly sourced Plant Based Cafe based in Vancouver. We believe in supporting local B.C. Farms by using quality, seasonal, organic ingredients whenever possible. Our goal is to make super tasty, healthy food more accessible and convenient for our customers. All of our food and drinks are easily accessible for Grab+Go or to stay and enjoy in our 14 seat Cafe. Our Cafe is white and bright with rustic elements from the 15 foot wooden bench seating to the black vintage Farm tools. We try to source all of our ingredients from local Organic B.C. Farms whenever possible. Our quest is to make the most delicious, healthy food possible. We are a Plant Based Cafe that uses ingredients from local B.C. Farms to create high quality food. Always seasonal and fresh, our menu takes inspiration from a lot of different cultures. 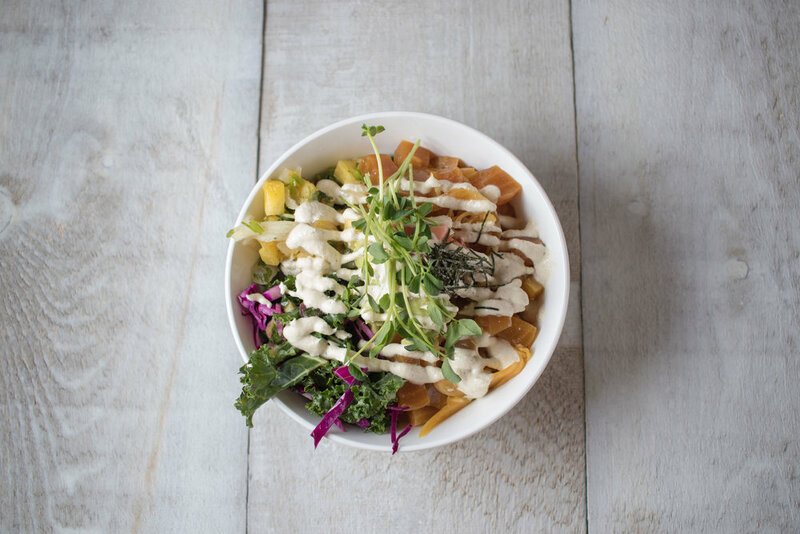 We serve a selection of globally inspired Bowls from our popular SouthWest Bowl to our Golden Beet Poke Bowl as well as our Seasonal Salad and more. Our Instagram-able Toasts boast a lot of flavour. Our Smoked Carrot Lox Toast is a local blogger favourite and has been featured in Canadian food magazines. Roots+Fruits makes fresh products in-house daily, from our fresh baked Vegan Banana Bread packed with Walnuts+Chocolate Chips to our popular Chia Pudding + Overnight Oats Jar selections.